The Admiral Kuznetsov is part of a group of Russian warships recently deployed near the Syrian coast. Nato had expressed concern planes from the carrier would be used to attack civilians in the Syrian city of Aleppo. "The pilot's health is not in danger," the ministry said, adding that he was ready to fly again. It said that flight operations had not been suspended. US officials quoted by Fox News said that the aircraft which crashed was a MiG-29K. The aircraft appeared to have mechanical difficulties shortly after take-off, the Washington Post reported, pointing out that MiG-29Ks were added to the Kuznetsov's carrier wing during the summer. The aircraft are specifically designed to handle the difficulties of operating from an aircraft carrier at sea, the paper reported, and are believed to be updated versions of MiG-29s, which have been in service since the 1980s. 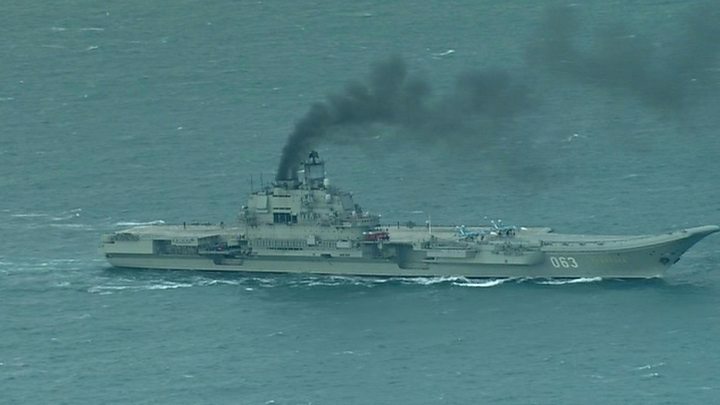 The Admiral Kuznetsov - Russia's sole aircraft carrier - can carry dozens of fighter bombers and helicopters. Its flotilla sailed from Russia to the Mediterranean via the English Channel last month. The ships refuelled at sea off North Africa after plans to dock at the Spanish port of Ceuta were cancelled amid Nato concerns over their mission. The naval group also includes a nuclear-powered battle cruiser, two anti-submarine warships and four support vessels, probably escorted by submarines. The group joined about 10 other Russian vessels already off the Syrian coast. Russia has been supporting Syrian government forces in the country's civil conflict, most recently targeting rebels in eastern Aleppo. The air strikes have been suspended recently but there are fears that, with the naval flotilla now in place, they will be stepped up again. Russia's naval task force: Power play or just theatre?